Romaine Park Primary is a new Tasmanian school that has been designed to give pupils the opportunity to learn in a state-of-the-art education facility, using the most up-to-date building materials. Artas, the architects for the project, specified the use of Replas recycled-plastic products due to their durability and sustainability. Recycled plastic was used to create a number of features around the school including wave shaped benches, garden edging and fencing. 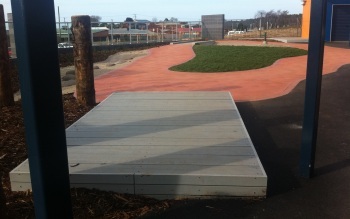 In the kindergarten playground, Enduroplank™ decking was used to build a couple of large platforms which can be used for seating or as a stage area. It was also used to create a footbridge over the bike track and a platform at the top of the slides. As recycled plastic is safe and non-toxic it was ideal to use in this environment. Principal Leanne Raw, said, ‘The grey colour blends in well with the natural environment. 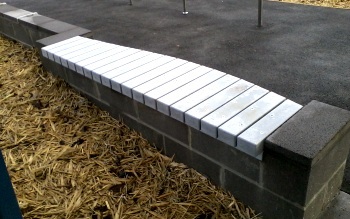 Their strength and durability will add to this play space’.